1.- Bracciole, Italian roulade consisting of beef, pork or chicken usually filled with Parmesan cheese, bread crumbs and eggs. 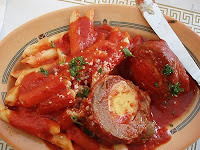 2.- Paupiette, French veal roulade filled with vegetables, fruits or sweetmeats. 3.- Rouladen, German and Hungarian beef roulade filled with onions, bacon and pickles. 4.- Španělské ptáčky are roulade in the Czech cuisine. The recipe is practically identical with German, perhaps omitting wine and adding a wedge of hard boiled egg and/or frankfurter to the filling. Unlike the large roulade, sliced before serving, they are typically 10 cm long, served whole with a side dish of rice or Czech style bread dumplings. 5.- Szüz tekercsek (so called Virgin rouladen) In Hungary the dish is known as , filled with minced meat. 6.- Nino Envuelto, In Mexico and Spain can be beef or pork and filled with almost anything you like, with or without sauce. A common form of roulade consists of a souffle-type mixture baked in a flat pan rolled around a filling. Appropriate to the meaning of the word however, a roulade may refer to any such "rolled" dish, such as sushi, and is not limited strictly to the European dishes. Roulades can be sweet as well as savoury. A common form of roulade consists of sponge cake or cake baked in a flat pan rolled around a filling. 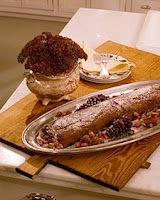 Cake rolled around jam, chocolate buttercream, nuts or other fillings, is an example of a sweet roulade like the cake Bejgli or the Swiss roll (we also call it Nino Envuelto). The Bûche de Noël or Yule Log is a traditional French Christmas cake roll, often decorated with frosting made to look like bark. Another form of sweet roulade is pumpkin flavoured cake rolled around cream cheese frosting. Cut steaks into serving size pieces or you can roll the whole thing and tie with string. Cover the meat with plastic wrap and drizzle some water (in drops on the meat). Use a meat pounder or heavy object and pound the meat until it's very thin -don't make holes in it. Combine garlic, crumbs, egg, bacon, oregano, cheese, parsley flakes, salt & pepper, some olive oil and make a thick paste with this. Spoon equal amounts of this mixture on steaks or spread over large meat, leaving about 1/4 inch at the sides. Roll steak and tie with string (see photo), or secure with toothpicks. Heat oil in skillet and brown rolls. Make your favorite tomato sauce, or use mine as a guide. Add tomatoes, garlic, 1 tsp oregano, 1/2 tsp salt, 1/8 tsp black pepper, sugar. Bring to a boil and simmer about 15 min. Add water if necessary- Add wine and cook another 10 min. Once it's ready, transfer to oven proof casserole and put the meat on top of it, spoon sauce on top of the meat. Cover with aluminium foil like a tent so the foil doesn't touch the top of the meat and seal well. Simmer covered (or bake in 350 degree oven) for 1 1/2 hours. Take meat out of the sauce. Allow to rest while cooling at least 15-30 min before slicing. To serve, put the sauce in a pan and reheat while you slice the meat. NOTE: Using this as a guide I hope you can imagine how you could also use chicken breasts, turkey, duck or any other form of protein for these "roll ups" as well. You can also see how many filling variations you could use too, right! All sorts of sauces and presentations that could give you lots of flexibility. I sent this recipe to a friend who prepared it in her crock-pot. Started the same way but put the little rolls in the pot carefully, covered with the sauce and had dinner all done when she got home from work. Bacon Wrapped Turkey Roulade.- We prefer this for Thanksgiving and you will too. It's amazing! Usually, we make a prosciutto and sage-stuffed turkey breast, wrapped in peppered bacon and basted with pear jam. It’s absolutely delicious. The bacon and jam keep the turkey nice and juicy, and the pepper is a perfect contrast to the sweet jam. We decided to change it up a little and picked caramelized onions and figs, goat cheese, cranberries and chopped toasted pecans. I still wrapped it in bacon — how could I not wrap it in bacon? Start by brining the turkey. Mix the salt and water together in a very large bowl or dish. Rinse the turkey and place in the brine for about 1 hour. You can brine while you caramelize the onions and figs. When you’re done brining, remove the turkey, rinse it thoroughly and pat it dry with paper towels. Discard the brine. Caramelize the onions and figs. Place a skillet over med heat. Once it’s hot, add the onions and shallots. Saute for 15 min, stirring occasionally, until the onions and shallots turn translucent. Add the figs and water (or stock) and continue to cook for another 15 min, until everything is a golden, caramelized color. Remove from heat. Preheat the oven to 325 F. Line a rimmed cookie sheet with parchment paper or foil, then set aside. Now, lay your bacon out length-wise on your work surface. You want each piece to slightly overlap the piece before it. Place the butterflied turkey breast on top of the bacon, with the butterflied, split portion perpendicular to the bacon. You want the bacon to wrap around the turkey when you roll it up. Layer the caramelized onions and figs, goat cheese, cranberries and pecans on the turkey, making sure to spread the filling out in an even layer, or your turkey will be hard to roll. Using both hands, start rolling the turkey onto itself like a fruit roll-up, stuffing the filling back in if it escapes. Wrap your butcher’s twine around the turkey breast. Place the turkey on the prepared cookie sheet, seem side down, and spread the pear jam all over the bacon. Bake for 1 1/2 – 2 hours. It’s done when the bacon is brown and caramelized. Remove from oven and let cool for 10 min, then slice into 1 1/2 – inch rounds and place on your serving dish. Drizzle with any drippings and serve immediately. NOTE: Very easy to slice, there's no waste and everyone will appreciate the flavors and easy eating this brings to your holiday. Fish and Seafood Roulade with Compound Butter.- A sophisticated dish that's very easy to do and looks fabulous! On your counter top lay out a sheet of parchment paper and top it with a layer of plastic wrap. Lay out your fillets of salmon, tails away from you. Overlap the fillets of flounder about 1-inch over the tails of the salmon. Then place the scallops on a metal skewer and set at the end of the flounder furthest from you. Sprinkle the herbs over the fish and season with salt and pepper. Using the plastic wrap pull the fish towards you so that the plastic begins to pull the flounder over the scallops. Be sure not to roll the plastic into the fish roll. Use a sheet pan to push the roll tightly as you pull the plastic toward you. The roll should be tight and you should be able to remove the sheet of plastic. It should be a tightly rolled tube. Then roll the fish in the parchment away from you so it is covered and can be place into the refrigerator. Refrigerate for 1 hour. and twist the ends. Place in the freezer for 10 minutes to set up. Slice into 1/4-inch rounds and remove the parchment. Preheat your broiler and place the oven rack 6-inches from the heating element. Remove the metal skewer and slice the roulade into 3/4 to 1-inch rounds. Place onto a broiler pan and brush each round with canola oil. Put under the broiler for 3 to 6 minutes depending on how well done you like your fish. Serve with 1 slice of compound butter on each fish roll. NOTE: A white wine sauce would also be nice or any number of other sauces you could pair this up with. British Strawberry Roulade.- Strawberry Roulade is a classic British dessert and a popular pick during the summer season. It's made with fresh strawberries and topped with light meringue and whipped cream; you'll find it at many potlucks and picnics across Britain, and it's served as a seasonal dessert in restaurants as well. Preheat oven to 400 degrees. Line a jelly roll pan or cookie sheet with sides with waxed paper and coat with melted butter. Separate eggs to remove the yolks. Beat the egg whites in a large bowl on medium to high speed. Slowly add sugar by the 1/4 cup until the mixture turns into a meringue. Beat until mixture is stiff and shiny. Spread meringue mixture on baking sheet and bake for 8-10 minutes until the sponge turns into a light gold color. Reduce heat of oven to 325 degrees, and bake the meringue for an additional 8 minutes. Remove meringue from the oven and run a knife around the sides of the pan to loosen it. Turn onto waxed paper and peel the paper off the sponge. Leave to cool for half an hour. entire dessert with powdered sugar. Cut into individual slices and garnish with slices of fresh strawberries and mint leaves. Enjoy! 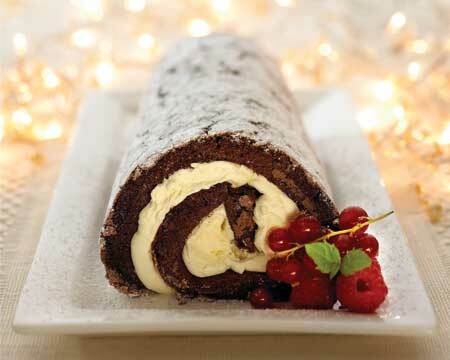 Chocolate Roulade Log.- A festive dessert perfect for the holidays! Preheat oven to 350 degrees with rack in center. Butter an 11 x17-inch jelly-roll pan or a 12 x 17 1/2-inch sheet pan, and line with parchment paper (I've found that I can get away with using aluminum foil instead, plus it's cheaper). In a small saucepan, heat 1 cup cream to a simmer. Add chocolate, reduce heat, and whisk until chocolate is melted. As soon as mixture is a uniform dark color, remove from heat and let cool for a few minutes. In a large bowl and using a hand mixer, whip egg whites and 2 tbl sugar to stiff, glossy peaks, about 1 1/2 min. Whisk one-quarter of the egg-white mixture into the chocolate mixture. Gently fold chocolate mixture back into the original egg-white mixture, and mix until smooth and well combined. Pour batter into the prepared pan, and spread it in an even layer with a rubber spatula. Bake until cake is set and puffy, 10 to 12 min. Transfer to a wire rack, and cool to room temperature. Lift parchment paper to remove cake from pan, (I leave a "lip" over the sides of the pan and use as "handles" when lifting. Makes it easier for me) and set it on work surface with long side facing edge of table. Using a fine-mesh sieve, lightly dust cake with cocoa powder. Make the creme chantilly: Whip the remaining 1 cup cream with the remaining 1 1/2 tbl sugar, the vanilla, and cognac. Spread evenly over entire surface of cake. Roll the cake lengthwise, starting at a point 2 to 3 inches over the creme chantilly. Roll cake another few inches, pressing against paper to make a tight spiral. Gently peel paper off as cake layer rolls away. Complete the roll, stopping at the far edge of the paper. Tuck the loose paper around and underneath the cylinder so it is well wrapped and can be moved easily. Serve immediately, or refrigerate for up to 4 hours. 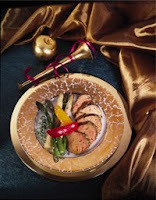 When ready to serve, transfer roulade to serving platter. Remove paper, gently rolling cake into center of platter, with seam on bottom. (If roll has slumped or twisted, lay a piece of plastic over top and sides, and reshape with hands gently) With a sharp knife, trim both ends of roll crosswise or on a diagonal. Dust top with confectioners' sugar and cocoa powder, and garnish with seasonal fruit. To serve, cut the roll into 1-inch-thick slices, and lay flat on dessert plates; top with additional creme chantilly if desired. I love Roulades! I find them practical and creative and we all enjoy it a lot! It was Rene's birthday yesterday (made him Pork Loin with Mustard Crust and a Spicy Orange Glaze, Bacon Mashed Potatoes and Asparragus with Almonds- he chose the menu) and we celebrated with a lovely day and wonderful meal. It's hard to believe our youngest is now 19! How time has flown!